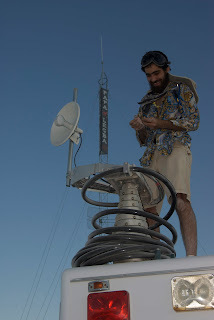 The OpenBTS Chronicles: Burning Man 2011 - Yes we were there. Burning Man 2011 - Yes we were there. MedWeb, Inc., a San Francisco-based telemedicine company involved in disaster response and humanitarian projects in several countries. MedWeb provided a lot of our technical infrastructure this year, in terms of mast trucks, satellite links and power systems. The UC Berkeley TIER group, a research group focused on information technology for humanitarian and development projects. TIER people brought some experimental applications to run on top of the OpenBTS VoIP network and also provided a lot of labor for the deployment and tear-down. Voxeo, a VoIP services company. Voxeo provided a lot of our off-playa call routing, along with some very clever call routing services. The other big difference from previous years was a that we ran a 3-site network instead of a single large site, making our 2011 plan considerably more ambitious than those of previous years. This year we also supported inbound call routing for everyone using a slick "NAT for telephone numbers" trick from Voxeo. We passed out expired China Mobile SIMs so that we would avoid accidentally catching handsets from the Commnet commercial network and we passed out about 150 Nokia C1 knock-offs for people who didn't have unlocked phones. Between the SIM requirement and the use of the DCS1800 band, we were deliberately limiting the user set to people who intentionally sought out our service, avoiding a lot of the congestion problems that has set in by Thursday or Friday on previous years. So how did it go? There were the usual aggravations and delays associated with any complex operation at Burning Man, but in the end the system worked and we had about 200 provisioned users. As usual, we learned a lot along the way. A lot of information is out there already, so instead of repeating it all, I'm just going to link to some of the more meaningful existing material. Interview by Chris Pirillio of David and the Voxeo crew. Video of David walking through the satellite van where we ran one BTS unit and our central servers, shot by our neighbor Soft Rock Dan. Mark talking about the system, with occasional breakaway shots of the constant parade of people and art cars passing the camp. The public wiki describing the technical details of the GSM network deployment. The pre-deployment public FAQ, which tells about the groups involved and describes the services we offered. We will post some performance statistics once we are finished compiling them. We are already planning next year's system. Wow, that sound ambitious :) It's nice to see the project growing up and constantly gaining in scale, support and sophistication. What are the plans for the next BM? Amazing progress David. I'm really glad to see the box you now have, looks sleek. Nice change of hat.